October 12, 2010 -- “Next Best Thing” will perform a concert of bluegrass music on Monday, October 25, at 7 p.m. at the Collins Theatre, 120 West Emerson Street, in downtown Paragould, Ark. The concert is part of the Bluegrass Monday concert series presented by KASU 91.9 FM at Arkansas State University. Admission is free, but KASU will literally “pass the hat” to collect money to pay the group. The suggested donation is $5 per person. “Next Best Thing” is led by Sally Berry and Tensel Sandker who are the daughters of bluegrass star Rhonda Vincent, named Female Vocalist of the Year seven consecutive years by the International Bluegrass Music Association. Berry and Sandker never planned for a career in music, only occasionally singing with their mother and never playing an instrument while growing up. When they enrolled at East Tennessee State University in 2007, they met fellow college students who played bluegrass music, and were encouraged in their pursuit of bluegrass by music instructors at the university. 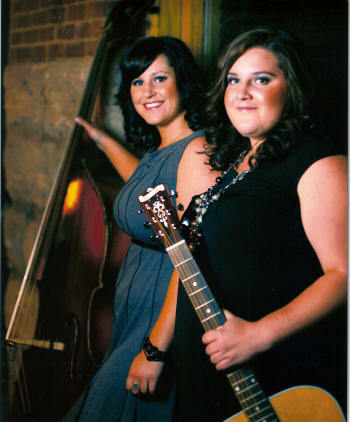 Now with other students from ETSU, the sisters perform as the “Next Best Thing.” They tour across the country and have become the sixth generation in the Vincent family to play music. “Next Best Thing” has released one CD, and they sing a trio with mom Rhonda Vincent on her latest CD. “Next Best Thing” has quickly become one of the most in-demand bands on the bluegrass music circuit, appearing at numerous acclaimed festivals and events. The group will appear on an upcoming edition of the WoodSongs Old Time Radio Hour, a syndicated radio program heard on almost 500 stations around the world. More information about the band is available at its website, www.nextbestthingband.com. In addition to the concert by “Next Best Thing” at 7:00 p.m., area bluegrass musicians are invited to come to Terry’s Café, 201 South Pruett Street (one block east of the Collins Theatre) beginning at 5:00 p.m. for an open jam session. Musicians are asked to bring only acoustic instruments and to play only bluegrass music. The jam sessions will end promptly at 6:45 p.m.
Also, Terry’s Café will be serving plate dinners beginning at 4:30 p.m. on the evenings of Bluegrass Monday concerts. Concessions will also be available at the Collins Theatre. Bluegrass Monday concerts are held on the fourth Monday night of each month. These concerts are presented with support from Phillips Funeral Home, Backbeat Music, Main Street Paragould, the Posey Peddler, the Northeast Arkansas Bluegrass Association and KASU. KASU, 91.9 FM, is the 100,000-watt public broadcasting service of Arkansas State University in Jonesboro. For more information, contact KASU Program Director Marty Scarbrough at mscarbro@astate.edu or 870-972-2367. Bluegrass Monday is also on Facebook (search “Bluegrass Monday”) and at www.myspace.com/bluegrassmonday.